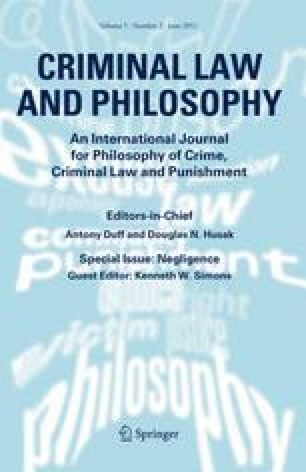 Negligence is a problematic basis for being morally blamed and punished for having caused some harm, because in such cases there is no choice to cause or allow—or risk causing or allowing—such harm to occur. The standard theories as to why inadvertent risk creation can be blameworthy despite the lack of culpable choice are that in such cases there is blame for: (1) an unexercised capacity to have adverted to the risk; (2) a defect in character explaining why one did not advert to the risk; (3) culpably acquiring or failing to rid oneself of these defects of character at some earlier time; (4) flawed use of those practical reasoning capacities that make one the person one is; or (5) chosen violation of per se rules about known precautions. Although each of these five theories can justify blame in some cases of negligence, none can justify blame in all cases intuitively thought to be cases of negligence, nor can any of these five theories show why inadvertent creation of an unreasonable risk, pure and simple, can be blameworthy. This paper was written during our tenure as Fellows at the Fleming Centre for Advancement of Legal Research at the Australian National University College of Law, Canberra, Australia. Our sincere thanks to the Centre and the ANU College of Law, together with their Director and Dean, Peter Cane and Michael Cooper, respectively, for providing us with such a congenial location in which to do this work. Our thanks also go to Larry Alexander, Peter Cane, Kim Ferzan, Doug Husak, Jonathan Schaffer, Ken Simons, and Holly Smith, for providing us with helpful comments on earlier drafts of the present article. Thanks also go to the participants at the University of Chicago Law School Faculty Workshop, October, 2010, for their helpful comments. In addition to those thanked above, we would also like to thank our expert Faculty Librarian Liason, Stephanie Davidson, and our energetic research assistant, Emily Norris (J.D. 2011), for their conscientious accumulation of relevant literature and thoughtful ideas on the topic. We are grateful, as well, to the University of Illinois and to those who endowed our faculty positions for supporting our research. Thanks also go to the participants of the University of Illinois Philosophy Department Faculty Colloquium, February, 2011, for their helpful comments. We owe a special thanks, finally, to our son, Aidan Moore, both for providing us with extensive field-experience on the topic of negligence and for regaling us over recent months with countless Darwin Award stories that have repeatedly refueled our discussions of this topic. Alexander, L., & Moore, M. (2007). Deontological ethics. In E. N. Zalta (Ed. ), Stanford encyclopedia of philosophy. url :http://plato.stanford.edu/. Husak, D. (2011). Negligence, belief, blame and criminal liability: The special case of forgetting. Criminal Law and Philosophy. doi: 10.1007/s11572-011-9115-z. Maier, J. (2010). Ability. In E. N. Zalta (Ed. ), The Stanford encyclopedia of philosophy (Winter 2010 ed. ), http://plato.stanford.edu/archives/win2010/entries/ability/. Smith, H. (2011). Non-tracing cases of culpable ignorance. Criminal Law and Philosophy. doi: 10.1007/s11572-011-9113-1.